In many ways the town was like dozens of other coastal communities, a bit off the main highway, situated on the bluffs above the beach, the businesses all congregating at the end of a two lane road. For a few years the town leaders had removed the signs that directed tourists from the highway, wanting to keep the community uncontaminated from outside influences. As it turned out, more visitors than ever traveled down the road, looking for the “secret town.” Eventually the town leaders saw that tourists weren’t necessarily a bad thing, as long as the businesses serving the tourists reflected classical “North Coast Chic.” There was no need to fear, there was little land left to build upon, the downtown would remain relatively small, four or five restaurant choices, the Inn, a couple of bed & breakfasts, and the general store, featuring a single, self-serve pump, dispensing generic fuel. The one thing that made this town slightly different from the other towns, was the small Traveler’s Rest Station, sponsored in part by the downtown Inn. It wasn’t much more than two remarkably clean restrooms, it was positioned just right, and it had a small fenced picnic area, with a great view of the water. The locals used it as much as the occasional traveler, with it’s convenient parking, shade trees, and cold, fresh spring water at the fountain. It wasn’t intended as a city park, but it certainly was used like one. The morning dew had not yet left the grass, so the young man sat on the picnic table bench, watching the road as it dropped into the town. He had been there since sunrise, hitching a ride in a dairy truck, carrying the common soft-sided travel bag, a large gym bag, a smaller backpack, and a Moroccan red leather briefcase. The briefcase was obviously new or at least well cared for, and stood out starkly from the muted colors of the young man’s other bags. The briefcase rested on a flat 2×6 that formed the top of the fence surrounding the picnic area, the other bags lay on the ground, closer to the restrooms. The young man arched his back, stretching muscles that had cramped from sitting on cold damp wood. The sun broke through the moving treetops, causing the brass fittings and hinges of the briefcase to flash, sending wind inspired code to those who could decipher it. The flashing brass was not noticed by the young man. His attention was on each car that broke through the line of evergreens on the ridge, each one bringing a look of expectation to his face. As the car wound down the ridge, the look would become studied, trying to focus on the make of the car, and the driver. Then expectation would turn to understanding, from understanding to resignation, from resignation to quiet watchfulness, and then the process would begin all over again, waiting for the next car. All this was perfectly understood by the innkeeper. He had watched the young man from the moment he got off his delivery truck. The inn’s kitchen windows faced the rest area, and as the innkeeper resupplied his dairy pantry, he could see very clearly the young man, the briefcase on the fence, and the ritualized road watching. The innkeeper remained at the window, transfixed by the flashing brass and the watching. “Who’s your friend?” the chef asked, as she entered the kitchen. “I don’t know, looks to be a hitchhiker, except he’s not hitching,” the innkeeper replied. “Waiting, I think. Just waiting…I don’t think he’s local… I mean, he’d probably come over to say hello, or make a phone call if he was. No, I think he’s been here before, he seems to know the layout, and he’s picked the best spot for watching the road into town. No, he’s definitely waiting, and seems a little bit anxious too,” the innkeeper noticed. “Well, I bet he’s getting hungry, so let me get this kitchen fired up. The regulars will be coming in, and the breakfast rush will be on,” the chef replied, with one eye on the huge wall clock, liberated from an early 1930s schoolroom. “Yep, worst thing in the world is to get between hungry people and food. You know, sometimes he looks just like a caged leopard, the way he paces. He walks like a cat. Soldier on leave? Or maybe he’s a courier, he certainly has the briefcase for it,” the innkeeper said, as his gaze fell on the Moroccan red leather, contrasting with the whitewash of the fence and the restroom door. The breakfast crowd had come, eaten, and gone. The kitchen was now changing menus to prepare for lunch. The innkeeper had been extremely busy in the late morning, checking out guests, and preparing for new ones. It was nearly noon before he had time to see if the young man still waited. Looking out the upstairs balcony, he could just see him through the tree leaves. “He’s still there…watching, as usual,” he said to no one in particular. Descending the backstairs into the kitchen, the innkeeper entered a room that had barely survived the breakfast onslaught. Pans, trays and utensils still lay scattered, like discarded weapons on a deserted battlefield. Yet, the general/chef ignored the disarray, and was now in the process of preparing for the lunch counter attack. “He’s still there, did you notice if he went anywhere for breakfast?” the innkeeper asked. “No, but I’ve been a little busy myself. Maybe he ate something before arriving. Maybe he’s a breatharian,” the chef said laughing, while finely chopping a head of iceberg lettuce. “You know, this kid is beginning to worry me, he hasn’t let up at all. He’s reacting exactly the same to that last car as he did the first car early this morning. Whoever he is waiting for is obviously very important to him,” the innkeeper said. “Well, then…it’s obviously a girl, and my guess is the news is not good. She should have been there hours ago, or maybe she was supposed to be already here waiting for him. Didn’t you have a young woman check out early this morning?” the chef asked slowly, as she joined the innkeeper at the window, watching the young man watch the road. “No, not this morning. But now that you mention it, there was a woman who asked about a room yesterday. I told her one was available, and she seemed satisfied, then she left. I expected her to come back with her checkbook or purse, but she didn’t. She was the right age, but I don’t know. She didn’t look like his type,” the innkeeper said, as he slowly stroked his beard. “Type? What do you mean ‘Not his type’? You don’t know his type, you don’t even know him! You can’t judge what might or might not be his choice in women!” the chef laughed. “True, and she’s probably not even connected. But I’m not so sure about not knowing him. I think I’m getting to know him a little more as each hour passes,” the innkeeper said quietly. The young man took a small break from the pacing, stopped in front of the briefcase and snapping both thumbs, he simultaneously released both spring loaded clasps. The case was new enough that it didn’t open smoothly, he had to use one hand to hold the bottom portion steady, while raising the top. Inside the case there were a few personal possessions, a large spiral bound notebook still in plastic, and a few maps. On the whole, it was oddly empty. Almost everything in it could have easily fit in his coat pockets. In the top portion there was an area for folders or business letters, and that too, was nearly empty, except for the one carefully folded letter. The young man unsnapped the strap holding the dividers and removed the letter, holding it in both hands, he read it without unfolding. Going over the words and phrases from memory. Then he unfolded the paper, looking at the single sheet, he began to read it once more. You can’t believe how excited I am to hear that you are finally on the way back home. It’s been such a long time, and I’ve missed you so much. I got your letter and I understand why you want me to meet you where we had that last picnic. I hope that you will understand when I tell you that I might not be there. It’s all so confusing. You must believe that everything that I’ve written has been true. But I haven’t written everything. I’m not the same person…things have happened that I haven’t told you. We’ve been apart too long. Sometimes I think that we can’t possibly know each other- that we can’t hold to past promises. We were such kids. Please believe that I loved you, and maybe I still love you. Maybe I’m just embarrassed that I don’t know you anymore, or you me! I know this sounds like a Dear John letter. It’s not meant to be. It’s just that you expect me to meet you, and I have to tell you that you might not like what you see. Things are so different, yet we act as if both of us have been placed in a time capsule. I have to tell you that I’m very torn, sometimes I think that it could work because of the past. Sometimes, I think it will not work because of the expectations and selfishness that comes with immaturity. I know this is hard reading in a letter. But it is a way to save us both from being hurt when we see each other. I’m giving you a chance to look at our relationship too. I would understand if you failed to meet me. If I came, would you be there ? I hope you liked my present, I sent it to your mother’s house for the obvious reasons. I know the color is a little bold for a briefcase, but you’ll get used to it, and it will be a real help when you go back to school. That is one future that you must follow up. The young man folded the letter careful, and placed it in the open case. He unwrapped the notebook paper, picked up a pen, and started to write. He thought very carefully, pausing for several minutes before writing each line. I know too well how confusing things are. All I’ve done for the past few months is to try to find answers. It’s like I’ve entered into a long and dangerous tunnel. I can’t remember who I was when I entered, and for most of the time, things are so dark that I have no idea where I am in the present. I’m struggling now, just as you are. I keep thinking about the phrase “light at the end of the tunnel,” and how hopeful that phrase sounds. I wish I could tell you where my heart has been. My real worry is not whether I love you but whether I can be trusted to love at all. I am now broken. I’ve seen too much of life. The dark side, where things are twisted, where the innocent are guilty, and the righteous fear the truth. I’ve seen the look in a man’s face, when he has nothing to believe in, nothing to live for. I didn’t want that face to be mine. It’s possible that the both of us can put the broken pieces together. I know the difference between memory and reality. I also know about clinging to a lifesaver. I understand and share your fears, I can’t answer these questions, and I won’t deny that there are problems. Writing slowly, pausing to watch each car as it crested the ridge, the young man finished the letter in about forty-five minutes. When he was done he didn’t tear it out of the notebook, he just replaced the notebook into the briefcase and closed the cover . Just then three or four cars began the descent into town, and each vehicle in turn required his full attention. “I wonder what it was that he was writing? He was at it pretty steady at it for awhile,” said the innkeeper while standing in the open doorway. The owner of the general store had just finished a late lunch, and he was heading back to his establishment. The two men paused long enough to follow the young man’s gaze as two more cars crested the ridge. “Yeah, I saw him looking in his briefcase earlier. Looks like he has some maps in there,” said the store owner. “Maps? How could you tell there were maps? We’re much closer here than your store, and I can’t see that he has any maps!” the innkeeper said incredulously. “I forget how small this town is. Lucky that we don’t have a traffic light or we would be reduced to watching it change. By the way, did you catch the color of his eyes?” the innkeeper said, with some exasperation. The afternoon passed and the shadows began to lengthen. The fog bank that sometimes blankets the coast in the late afternoon had failed to appear for the last several days. The evening promised to be mild, and the sunset spectacular. The young man had not moved out of the general area of the picnic bench, except to go to the restroom. He was vaguely aware of the weather, only to the extent that he noticed that it was unnecessary to put on a jacket. His bags remained unpacked and untouched. It was doubtful that he would notice the sunset. His interest in his surroundings was minimal. Several times during the day, a passing stranger would attempt a conversation. The young man would smile and answer questions with very few words, his attention directed to the coming traffic more than the present company. The overall impression was that he was polite, but very busy. By the end of the day everyone in the town had quietly noted his presence. “So, what you think? He’s got to be hungry, I haven’t seen him eat anything all day, and he’s barely had any water. I’ll take him a sandwich and tell him it’s for the road. I mean, he doesn’t have to eat it now, he could eat it later,” the chef reasoned. The small gathering of townsfolk stood in the Inn’s lobby and looked out the front bay window, looking towards the little picnic area and the young man. The general store owner and his wife, the innkeeper, the chef and several waitresses, and several more people from businesses further up the street. “I don’t know, I just don’t think food is very important to him right now. If any of us goes over there, then he’ll know that we’ve been watching him. It just might make him uncomfortable,” replied the innkeeper. “Well of course we’ve been watching him, what’s the harm in that? But you’re right. He hasn’t bothered anyone and we shouldn’t bother him. Come on, let’s leave him to his business. It’ll be dark soon and he’ll have to make the decision to get a room, or get a ride out of town. He certainly can’t camp out in our picnic area,” the general store owner said with some finality. The innkeeper wasn’t sure that the young man would rent a room. And he wasn’t sure that anyone should force the issue. By tradition the innkeeper was responsible for the maintenance of the rest stop, but technically it was the town’s property, with a stipend given to the innkeeper for his work. A few times during the year he would have to say something to someone who was obviously using the spot as a campground, but that was rare. The place was just too public, and under the watchful eyes of a half-dozen businesses. No, he wasn’t sure that he was going to tell the young man to move on. Night fell and the young man stood his post as before. The cars were not coming over the ridge in nearly the numbers as during the day. But there was nothing in his physical demeanor that suggested defeat, or that he had given up hope. About three hours after sunset, a salesman stopped at the restroom, and asked if the young man if he needed a ride. The salesman had no knowledge of the day long vigil, it seemed to him that the young man was hitchhiking, so he volunteered a ride. The young man said yes, and reached for his bag. And that was how it ended. Quickly and undramatically. The salesman said that he would help get the rest of his gear, and within minutes, they were both heading up the ridge, climbing towards the highway. The young man still watched for the oncoming traffic, but none came. It wasn’t until the following morning that he realized his briefcase was missing. By that time, he was hundreds of miles away, and his heart and mind even further. No one in the town noticed the departure of the young man. Just before midnight, the innkeeper walked over to the rest area, then he saw the briefcase still on the fence. He quickly turned and retraced his steps, fearing that if he ran into the young man, then he might have to say something. “Tomorrow, if he’s still here tomorrow night, then I’ll say something…tonight, I’ll let him be,” the innkeeper said, with more hope than conviction. The early morning horizon anticipated the sun, pre-lighting the mountains and the evergreens, creating a glow on the ocean. Birds were awake, singing the sun’s invitational song, and the innkeeper was rubbing the sleep from his eyes. As he made a morning cup of tea, he looked through the kitchen window and could just make out the image of the briefcase on the fence. The picnic area remained in shadows, but it looked to him that a figure was stretched out on the bench. “Mm, the young lion sleeps,” he muttered with a smile, as he added the last drops from yesterday’s lemon. A few minutes later the sun broke through the ridge line, the brass flashed, and it was clear that the bench contained nothing but shadows. The innkeeper was a little perplexed. Then he thought that the young man was in the restroom, perhaps shaving…getting ready for another day of waiting and watching. By the second cup of tea it was clear that the innkeeper was going to have to risk encountering him. Something was not right. Something was quite wrong. The young man was not in the restroom. The briefcase was on the fence, but there was no sign of him or his other baggage. The innkeeper sat on the bench and watched the road. “He must of left last night, maybe even before my midnight walk. I didn’t see him then, or the other bags, I just saw the briefcase. When was the last time I saw him?” the innkeeper thought. He rose from the bench and approached the briefcase. After looking for any nametags, he began releasing the clasps, one after another, then he slowly raised the top. “If he accidentally left this behind, then I suppose I should try to see if there is a phone number or address. Even a name might do…” The innkeeper slowly looked through the contents. There wasn’t much to look at, no cards, no identification. The maps were of California and Europe. The European map had a route marked in felt tip pen, winding through most of the countries, with stops in various cities. Still no names or addresses. Finally the innkeeper came to the last two items, the folded letter and the spiral notebook. The innkeeper was reluctant to read what was obviously private correspondence, but it seemed to him the last chance to find the owner of the briefcase. He read the letter from Gayle first. Then he read the notebook written by William. “William, his name was William,” he said aloud softly. It was then that the first car of the day came through the trees and down the ridge. The innkeeper turned and studied the car and the driver. “No one I know, ” he thought, then the car turned right and continued to the residential area on the bluffs. He stared at the briefcase, then looked to the road. After a few minutes he closed the case and returned to the inn. “I couldn’t find any identification inside, but I did read something that suggests that a friend of his might be driving by. If the briefcase is there, she will recognize it, then she will certainly stop and ask questions. If I bring the briefcase inside, then she might not stop at all, just turn around and drive out,” the innkeeper explained. “Oh, well, I suppose so…. But if she is supposed to meet him here, wouldn’t she get out and ask a few questions, briefcase or no briefcase?” the chef asked. “I suppose she might, if she was motivated enough. But I got the sense that she might just drive down looking, and if nothing was there, then it would be a sign and she would leave. If she sees the briefcase, she’ll recognize it and she’ll stop. We will have to explain that he left it, but at least we can give it to her, and she can deliver it to the young man personally. After all, it was a gift from her originally,” the innkeeper said quietly. “You found all this information in the briefcase? And no identification?” the chef asked. “His name is William, her name is Gayle,” the innkeeper responded, as he looked once more out the window towards the ridgeline, then back to the briefcase. Throughout the morning the innkeeper retold his plan to the various people who asked about the briefcase. Everyone thought that it was a pretty good plan, and all agreed that they would attempt to stand guard to make sure that the briefcase didn’t walk off with a stranger. The general store owner was the first one to actually sneak over to verify for himself that the innkeeper’s plan of action was correct. After reading the letters he was absolutely convinced. 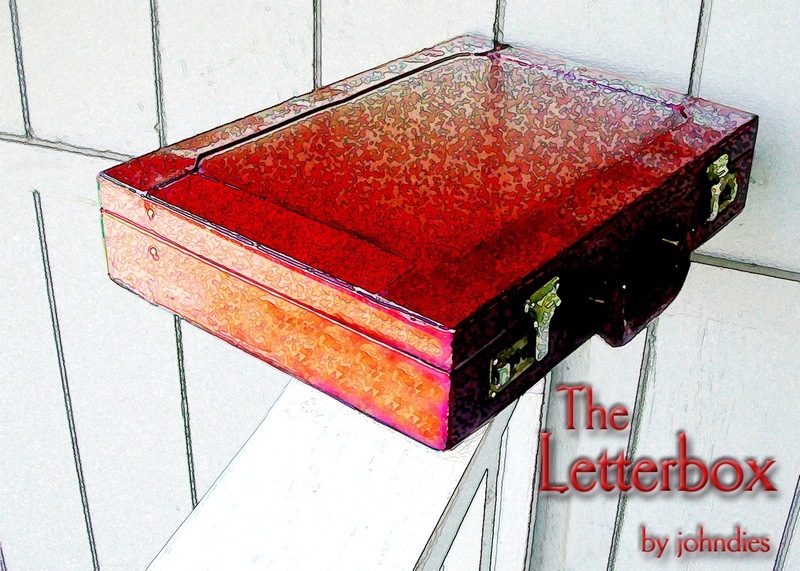 Before the lunch time rush, it seemed that everyone in the town had found the time to read the letters, and most agreed with the innkeeper that they should all stand watch, and leave the briefcase in plain sight. People continued to come down the road into the town. Everyone was watching for a single young woman, who might be driving slowly, looking for the young man, looking for William. Even with a dozen pair of eyes, there were times that the briefcase stood unguarded and the road unwatched. Not one of the townspeople had the discipline of the young man. Yet, at the day’s end, the briefcase was still there, unmolested and unharmed. The innkeeper had previously decided, with everyone agreeing, that the case should be brought in for the evening, and that at least for a couple more days, the briefcase should return to the fence, first thing in the morning. Perhaps the young man would return for it, and maybe even Gayle. It remained safe this first day, and that was a good sign. Right after supper the innkeeper walked over to the fence, took the briefcase by the handle and walked back to the Inn’s kitchen. It just so happened that a half dozen of the interested people were waiting for his return. “Well, here it is,” the innkeeper said as he was opening the clasps, “and looks like nothing is missing. Wait a minute, this wasn’t here earlier. Did any of you put this here?” as the innkeeper held a few pages torn from the notebook, carefully folded like a letter. “No, not me!” “Not me either!” “Well, I didn’t do it but I saw it in there about five o’clock this afternoon, but I thought it was supposed to be there,” said one of the waitresses that hadn’t had the time to read the letters, but did open the briefcase to have a quick look. “Well, what is it? What does it say?” asked the store owner. I don’t know if you will have a chance to read this, my hope is that you will. I hope you don’t mind that I read your letters. I saw the briefcase and I tried to see if there was any identification. I hope that someone comes back for this. William: Please have patience. Whatever you have gone through, remember that you have gone through it. It doesn’t have to live in the present or the future, it’s the past. It’s over. That doesn’t automatically restore order in the world. Nor does it mean that you can ignore or pretend the past doesn’t exist. God doesn’t give you more than you can handle. Be patient and be attuned. Stay focused and honest with what you know, share what you are feeling. Don’t use one failure or a dozen failures as an excuse to quit. Learn to love, this doesn’t require any more than your willingness, it doesn’t even require a girlfriend or wife. Talk to your pastor, priest or minister, they should be able to help. Gayle: It’s the same advice. Learn to love, learn to forgive. They are both selfless acts of will, not feelings that spontaneously show up or disappear. Avoidance is not a healthy choice, and never provides a permanent solution. “No, but it is a very good letter, I hope they get to read it,” one of the waitresses replied. Lacking a decision, they just let it be. The following day the innkeeper tried to watch the briefcase more closely. Three times he was able to spot different people looking in the briefcase. By the time he could reach them they had either gone to the restroom, or they had driven off in their cars. He realized that he could not provide very much security if someone was dedicated to stealing the briefcase. The choice was to leave the briefcase where it was, or to bring it inside as he did every evening. The idea of chaining it to the fence seemed just plain silly. He decided that leaving the briefcase alone was the least intrusive action. At the end of the second day there was another letter from an anonymous person. It was another good letter, pointing out an entirely different perspective from the first, but still sensitive and heartfelt. The innkeeper thought he recognized the handwriting. “Everything still looks pretty much the same,” Bill thought. He hadn’t been in this part of the country for a long time, and in fact, had only been in this specific spot twice. “Yep, same twisting road coming down from the ridge.” It didn’t appear to him that the business section had grown much, although he wasn’t sure he remembered what had been there. He did remember the picnic area, and parked his car in a spot near the restrooms. It was the same clean rest stop, obviously still well cared for, a coat of new white paint on the restroom doors, and on the fence where the briefcase rested. A red Moroccan briefcase! His mind reeled. His briefcase! It’s still on the fence! Bill could hardly believe his eyes, disbelief paralyzing his body, fingers twitching in random fashion while gripping the steering wheel. He remembered the last time he saw the briefcase, and he thought that he had left it in the car that had given him the ride out of town. Seeing it resting on the fence, he realized that the briefcase had never made it into the car. All these years he had assumed that the driver had intentionally driven off with his briefcase as ‘payment’ for the ride. Instead, it had simply been left behind. “But why is it still sitting there? It’s been thirteen years.” That was the obvious question. Bill was now struggling with the meaning and intent of what he found. In the binders there were letters, carefully inserted into plastic sleeves, written in response to the original letters between William and Gayle. The display also included hundreds of items that had been left in the briefcase. Things like lockets, pressed flowers, concert tickets, earrings, key chains, charms, bottle caps, passports, coffee cups, ID bracelets, and rings. Bill turned to the briefcase. The lid opened quite easily, inside there was a folded copy of Gayle’s letter, and next to it a folded copy of his letter. Except for a small stack of blank, ruled paper and some pens, the rest of the briefcase was empty. Bill looked around and didn’t see anyone watching him. The briefcase wasn’t fastened down or secured in any way. He thought for a moment that since it was his property, it would be perfectly within his rights to just pickup the briefcase and put it in his car. But what was going on with this shrine? Who’s responsible, and why? The binders were obviously holding letters written by different people, written with the hope that William or Gayle might read them. He opened the first binder and noticed the first letter was dated and numbered. The letter was from Renee, and it appeared to be written very soon after he left town. It was a sensitive and wise letter. William then read a few more, skipping around and continuing to the other binders. He guessed that there probably an average of one or two letters per week for thirteen years. Some were very short, and a number of them were quite long. After fifteen or twenty minutes Bill stopped reading, the formation of the words on the page getting harder and harder to recognize. Walking towards the Inn, Bill was still in deep shock. He was unsure of how to act or what he supposed to do, but for now he left the briefcase on the fence. He paused for a moment on the steps of the Inn, assessing whether to go in or turn around and head for his car. Without consciously deciding, he continued on, heading for the Inn’s check-in desk. The innkeeper was standing behind the desk, and had been watching Bill’s approach. “Did you lose something, sir?” the innkeeper asked. “No, uh, no, I just was wondering, well…What’s going on with those letters by the restrooms?” Bill responded, with some hesitation. “So, it’s been like this for thirteen years? People are still writing? I mean, I read a few of them, they seem genuine, even the later ones. It’s just so…After all these years how can anyone even know if they’re alive?” said Bill. “I guess that’s true. Except I’m pretty sure they are. In fact, a few years ago a fellow came through who knew both of them very well. He said William had been falsely imprisoned for three or four years, and Gayle was nervous about the relationship they once had. Things worked out for them though, and they’re happy somewhere in the mid-west. They even visited here once, but didn’t let on. That’s how he found out about it, they told him, and he thought he would come see for himself. Good people,” said the innkeeper. Bill just nodded and looked back at the briefcase, then up to the ridge, where the road broke through the line of evergreens. The pause became apparent and the innkeeper cleared his throat, as a faint memory flickered. “No, huh, I’m fine…It’s just that…I was wondering if it would be all right if I wrote a letter for the briefcase?” said Bill. “Sure, people do all the time,” said the Innkeeper, smiling.